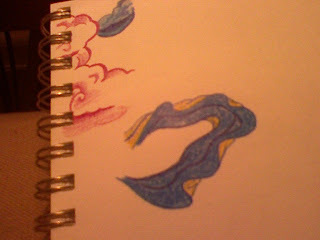 I've decided to teach myself a Tibetan style of art- so tonight I got some pictures and started practicing. I know these are just two tiny things, but it whet my appetite. I am totally intrigued with this style and wish I could just sit at a coffee shop all day with my new pencils and just draw and draw. I have a ridiculously long attention span for detail-laden drawings- this style I think will suit me well. Is it wrong to take off work so I can color pretty pictures? Oh, and go for a ride?